ASEAN celebrates its 50th anniversary this year, which is by no means a trivial accomplishment. However, it is facing an increasingly fluid and tense geopolitical situation, demonstrated most clearly by the political wrangling seen in ASEAN meetings in recent years, mostly over the South China Sea disputes. Moreover, the election of President Donald Trump, with his confrontational style and unpredictability, has dramatically raised uncertainty over the nature of U.S. regional engagement. Tensions between the United States and North Korea over the latter’s missile and nuclear programs have also been soaring. At the same time, Chinese assertive behavior in the region is unlikely to abate, putting it on a possible collision course with the United States. Even North Korea has attempted to reach out to ASEAN to encourage it to oppose the United States. Within Southeast Asia, the Chairman’s Statement of the 30th ASEAN Summit notably shied away from any explicit reference to China’s reclamation activities in the South China Sea, even though it took note of some ASEAN leaders’ concerns over developments there. It is important to examine the impact of the evolving strategic landscape on defense multilateralism in ASEAN — an arena that has generally seen a positive trajectory — and more importantly, what can be done in response. This analysis specifically focuses on the role of the ASEAN Defense Ministers Meeting (ADMM) in managing regional dynamics. The ADMM has typically shied away from discussing traditional security issues, especially those deemed as too politically sensitive. It has instead focused on nontraditional security issues such as humanitarian assistance and disaster relief (HADR) and counterterrorism. However, the ADMM is facing major challenges to its unity, particularly as the strategic landscape continues to transform. The ADMM is the first ASEAN forum that brings the defense chiefs of the ten ASEAN countries to the same venue to discuss defense and security issues. It has been successful in advancing cooperation in nontraditional security areas, especially in HADR, and has also enabled ADMM member countries to constructively interact with selected extra-regional countries through the ADMM-Plus. However, the ADMM is facing challenges coming from the ASEAN level, particularly over tensions in the South China Sea, and must reckon with the fault lines within ASEAN and the changing security landscape in the Asia Pacific region. As the region is buffeted by dynamic geopolitical forces, the ADMM’s focus on building trust and confidence by cooperating in nontraditional security issues may be increasingly insufficient. If the ADMM continues to sweep all prickly traditional security matters under the rug, they may well emerge to affect cooperation even in the nontraditional security realm, as they did in 2013 when China initially gave relatively small sums of aid to the Philippines in the aftermath of Typhoon Haiyan, ostensibly due to their disputes in the South China Sea. The ADMM, as the main platform for discussions on defense and security issues, should ideally step up to address these traditional security issues, though in a way that is acceptable to all parties. However, the ADMM still appears to only be interested in maintaining a narrow focus on discussion and cooperation over nontraditional security issues, and for good reason. Is the ADMM Ready to Discuss Traditional Security? The ADMM may not be the most well-positioned platform to discuss traditional security issues. These mainly comprise the protection of national security and sovereignty from external state-level threats and the management of the impact of major power competition. Mutual trust has not been fully established among ASEAN states, as political grievances and divergent national interests still exist among them. In addition, the structure and norms of ASEAN and the ADMM also hinder the forthright discussions of traditional security matters. The ASEAN Way ensures that the national interests of individual member states are upheld, so long as they do not interfere with those of others. The ASEAN countries, with their different national priorities and different approaches in their relations with the United States and China, have divergent views on how to deal with the South China Sea and other traditional security issues, making such discussions politically sensitive. However, that is not to say that ASEAN and the ADMM should simply remain within their comfort zone of non-traditional security issues. Given regional dynamics, the ADMM would need to consider going beyond discussions of non-traditional security issues. Considering that the ADMM is not ready to move fully into discussions on traditional security, the “grey area” – issues which overlap between the traditional and non-traditional security realm – could be more appropriate. Issues in this “grey area” include defense diplomacy, confidence-building measures, and crisis mitigation. Defense diplomacy could include military-to-military discussions on how to reduce tensions arising from territorial disputes, as well as dialogues on how militaries pursue nontraditional security cooperation such as in HADR cooperation. Similarly, confidence building could constitute military exercises on rules of engagement or search-and-rescue exercises. Crisis mitigation also often overlaps with both traditional and nontraditional security, as can be seen in measures like direct communication lines, which can be used to resolve a crisis between the navies of two countries, or used in coordinated hot pursuit of pirates at sea. A possible way forward would be the conduct of working groups at the ADMM level to consider how such issues can be deliberated at the ADMM. These could be held apart from the main ADMM meetings, so that the discussants, while representing their own country’s defense establishment, will have the relative freedom to raise ideas and undertake discussions that are deemed too sensitive to be publicly articulated. This could be a first step toward more substantial dialogues at the ADMM on traditional security issues in the region. 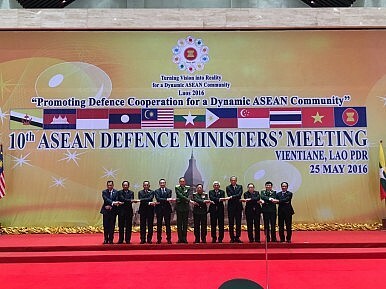 At the same time, the ADMM could work with certain ASEAN mechanisms such as the ASEAN High Council, which is meant to be involved in interstate dispute negotiations, and the ASEAN Troika, which would convene in response to any emerging situation to discuss and advise ASEAN foreign ministers, to mitigate regional tensions and address any emerging crises. With the region facing much geopolitical uncertainty, the ADMM should step up to the plate to broach the subject of traditional security in its discussions. Nevertheless, given the realities of ASEAN’s structure and the divergent national interests of ASEAN states, particularly where defense and security are concerned, the ADMM must proceed with such an endeavor cautiously. One way would be to begin with the “grey area” issues, before proceeding with more substantial discussions on traditional security, at a pace comfortable for all ASEAN states. Henrick Z. Tsjeng is Associate Research Fellow with the Regional Security Architecture Programme, Institute of Defence and Strategic Studies (IDSS), S. Rajaratnam School of International Studies (RSIS), Nanyang Technological University, Singapore.